guidance for the princely court. Rus' Justice (Rus' Justice or Rus’ Law; Old East Slavic: Правда роусьскаꙗ, Pravda Rusĭskaya (13th century, 1280), Правда Руськая, Pravda Rus'kaya (second half of the 15th century); Russian: Русская правда, Russkaya Pravda; Ukrainian: Руська Правда, Rus'ka Pravda) was the legal code of Kievan Rus' and the subsequent Rus' principalities during the times of feudal division. It was written at the beginning of the 12th century and remade during many centuries. The basis of the Russkaya Pravda, Pravda of Yaroslav was written at the beginning of the 11th century. Russkaya Pravda was a main source of Old Russian Law. In spite of great influence of Byzantine legislation on the contemporary world, and in spite of great cultural and commercial ties between Byzantium and Kievan Rus', Rus' Justice bore no similarity whatsoever to that of the Byzantine Empire. The absence of capital and corporal punishment rather reflects the Norse way of thought. Three recensions of Russkaya Pravda are known: the Short Edition (Kratkaya), the Extensive Edition (Prostrannaya), and the Abridged Edition (Sokrashchyonnaya). Over 110 extant copies dating from the 13th to the 18th centuries are preserved, included in various manuscripts: chronicles and compilations. Of these, over 100 copies, including the oldest preserved, are of the Extensive Edition. This code was discovered by the historian Vasily Tatischev in the text of one of the Novgorod chronicles and brought to the attention of the Russian Academy of Sciences in 1738. The first commented edition of the text was published by August Ludwig von Schlözer in 1767. Pravda Rus'skaya’s legal regulations reflected the evolution of the social relations in the Rus' of the 11th-13th centuries. Common law, Knyaz legislation, and legal proceedings represented the basis of “RP”. The Short Edition of Rus' Justice contains two apparently distinct parts, called by researchers Pravda Yaroslava (Yaroslav’s Law, ca. 1017), otherwise known as Drevneyshaya Pravda (the Oldest Justice) of Yaroslav the Wise, and Pravda Yaroslavichey (The Law by Yaroslav’s sons, ca. 1054). Some indicate other distinct components of the text, possibly added later. The Yaroslav’s Law comprised legal regulations of feudal law along with the archaic regulations that could be traced back to the primitive communal system. According to a popular theory, it was promulgated in order to settle a conflict between Konstantin Dobrynich, a posadnik of Novgorod, and the Varangian population of the city. Subsequent development and improvement of the Rus' Justice took place in times of Yaroslav's sons and his grandson Vladimir Monomakh. New provisions are believed to have been added to Pravda Rus'skaya after the revolts in Kiev, Novgorod, and Rostov-Suzdal province in 1068–1071. In the arising Russian state, the Pravda Rus'skaya was replaced in 1497 by the Sudebnik, the Code of Law. Several centuries earlier, new legal codes were promulgated in Pskov and Novgorod. “Pravda Yaroslavichey” increased responsibility of a given community for killing knyaz’es soldiers, tiuns (“tiun”, a privileged servant of knyazs or boyars), starostas (“starosta”, a representative from the low-ranking administration of a knyaz), otroks (“otrok”, a low-ranking soldier in the army of a knyaz) and other servants on their own territory. “Pravda Yaroslavichey” provided severe punishment for arson, deliberate cattle mutilation, and collective encroachment on rich people's property. After the 1113 Riot in Kiev, an exorbitant interest law was introduced that limited financial operations of moneylenders. “RP” stabilized the system of feudal relations and social inequality. During 11th-13th centuries “RP” served the strengthening of feudal dependency of smerds (“smerd” – a feudal-dependent peasant), zakups (“zakup” - a feudal-dependent peasant, who could become free after paying off his “zakup”, a feudal loan), kholops (“kholop” – a feudal-dependent peasant, who could be killed or sold like a slave) etc. The Vast Edition of “RP” contains special regulations with regards to the status of zakups and kholops. “RP” also reflects the role of the court of knyaz’, a trend towards increasing differentiation of punishments and penalties, larger fines for the benefit of knyaz’ or his administration with correspondingly decreasing compensation to the victims. In an attempt to abolish blood feud (that was quite common at that time), “RP” narrowed its “usage” and limited the number of avengers to the closest relatives of the dead. If there were no avengers on the victim's side, the killer had to pay a fine (called “vyra”) in favour of the knyaz’ and partial compensation to the relatives of the victim (the killer's community had to help him pay his fine). If a woman were killed, one would have to pay half of the regular fine (called “poluvir’ye”, half of “vyra”). “RP” also defended the health and honour of the free members of the feudal society and had provisions about financial compensations for mutilation or an insult by word or deed. “RP” had a detailed system of punishments and penalties for larceny in a city or countryside, deliberate damage to forests, hunting grounds or lands, trespassing etc. It also regulated debt relations between individuals and contained articles of liability and hereditary law. Under “RP”, legal proceedings included use of witnesses, use of oaths and use of “ordaliy” (lat. ordalium, or “ordeal” in English), a kind of a last-resort test used to prove defendant's innocence or guilt. The search for culprits included listening to witnesses, collecting evidence, or hot pursuit. Investigators had to check for false accusations, as well. These were the first steps towards forensic science. 1. If a man kills a man: then a brother avenges a brother, or a son avenges a father, or a cousin, or a nephew; if no one takes revenge, then 80 grivnas for the murdered, if he is a knyaz’s man or knyaz's official; if he is a rusin, or a grid' (a lower-ranking druzhinnik), or a merchant, or a boyar’s official, or a mechnik (swordsman), or an exile, or a slovenin (Novgorodian), then 40 grivnas for the murdered. 2. After Yaroslav’s death there was another meeting between his sons Izyaslav, Svyatoslav and Vsevolod, and their men Kosnyachko, Pereneg, Nikofor, and they changed the blood revenge for a fine; and the rest of his sons asserted as Yaroslav judged. 3. If anyone murders a man in a rampage, and the villain is not being sought, then the community where the victim's head lies pays a vyra (fee to the knyaz) of 80 grivnas; or be he a commoner, then 40 grivnas (note: this was a fortune; a horse cost two grivnas, and a serf 1/2 grivna). 4. Whichever community pays the common vyra (i.e. the fee for the murderer they're hiding or cannot find), several years they shall have to pay that, as the members are paying without the murderer. But if the murderer is known to the community, they shall help him with the payments; but only pay up to 40 grivnas, and the murderer pays the rest, and also contributes to his community's 40 grivnas. Or if he murdered by accident, or at a feast, he shall pay thus. Thus shall be on the guilt of rampage. 5. If there be a murder and robbery with no reason, then people shall not pay for the murderer, but give him up with his wife and children, and his property will be plundered. 6. If a person does not contribute to the vyra, then the people shall not help him (in the future); he shall pay for himself. 7. And such is the law for Yaroslav's vyra collector: the vyra collector takes 7 buckets of hops per week, also sheep or a meat carcass or 2 nogata (1 nogata = 1/20th of grivna); and on a Wednesday cheese and a marten pelt; and the same on Friday; and give him two chickens per day; and seven breads per week; and seven measures of grain; and seven measures of peas; and seven measures of salt; this for a vyra collector with a man; and for him 4 horses, which be given a measure of oats; for vyra collector 8 grivnas and 10 kunas in fees, and for the pageboy 12 squirrel pelts; and a grivna when he goes away, and for each victim 3 grivnas. 11. But for a village supervisor, or the field work supervisor, 12 grivnas. And for a serf, 5 grivnas. Same for boyar's. 12. And for a tradesman and a tradeswoman, 12 grivnas. 13. And for a serf, 5 grvinas; for serf woman, 6 grivnas. 14. And for a teacher, 12, same for a nanny, whether they be serfs or women. 17. And if one is accused of murder, but there are no acceptable witnesses, there shall be trial by iron. Thus shall be done for all grievances or thievery, if the accuser cannot provide proof, and the grievance is for less than half of gold grivna, then give him a trial by iron in captivity; if the grievance is for less than that, but more than two silver grivnas, then trial by water; if it is even less, then he must make an oath. 48. 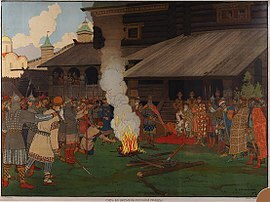 Volodimer Vsevolodich, upon Svyatopolk’s death, gathered his druzhina at Berestov: Ratibor of Kiev the general; Prokopiy of Belgorod the general; Stanislav of Pereyaslavl the general; Nazhir; Miroslav; Ivanok son of Chudin boyar of Oleg; and they set thus: to collect interest only until the third payment, if the lender takes the payments “in threes” (three payments of one half the debt each); if one takes from the debtor two shares, he can ask for the full debt then; but if he collected three shares, then will not ask for the full sum. 49. And if one takes from the debtor 10 marten pelts per year on each grivna (20% APR), that is allowed. 52. If a debtor escapes from master, then a serf; but if he goes to search for money with his master's permission, or goes to the knyaz with a complaint against his master, then won’t be made a serf, but be given a trial. 57. If a debtor steals something, the master is in his right; when the debtor is caught the master may reimburse the victim for his horse or whatever else, and makes the debtor his serf; or if the master does not want to reimburse, then he may sell his debtor into serfdom, and reimburse the victim from that, and keep the rest. 59. A serf may not be a witness; but if there are no free witnesses, then a serf caretaker may bear witness, but any others may not. And for minor cases a debtor may be a witness. 65. If one violates land borders, or works somebody else's land, or puts a fence on somebody else's land, then he’ll pay 12 grivnas to the knyaz. 69. And if he steels bees, then 3 grivnas to the knyaz; and for the honey, if the beehive was full, 10 marten pelts to the victim; but if an empty hive then 5 marten pelts. 71. If a serf tortures a serf without orders from the knyaz, then pays 3 grivnas to the knyaz, and 1 marten pelt to the victim for his suffering. 72. But if he tortures a knyaz's man, then 12 grivnas to the knyaz, and 1 marten pelt to the victim for his suffering. 79. If a barn is burned, then the victim's house and property is plundered, after the damage is repaid, and for the rest he’ll be a serf to the knyaz; same for burning of houses. 80. And if one intentionally cuts a horse or other cattle, then he’ll pay 12 grivnas to the knyaz, and also repay the victim for the damages. 85. If a serf dies, then his property goes to the knyaz; if he has unmarried daughters then some of the property will be given to them for dowry; if all his daughters are married they don’t get it. 86. If a boyar or a druzhina member dies, then his property does not go to the knyaz; and if he had no sons, then the inheritance goes to his daughters. 102. There are three types of serfdom: one buys a serf for up to half a grivna before witnesses, and gives a nogata to the judge before the serf. 103. A second serfdom: if one marries a serf woman without her master's agreement; if he marries with agreement, then whatever they decide with the master, thus he shall be. 104. And this is the third serfdom: if one acts as someone's official or servant without the master's knowledge; if there is an agreement, then whatever they decide, thus he shall be. If he takes the master's tasks, he's his servant. 105. But for a debt of grain, one will not become a serf; but if he does not work it off in time, then he must repay it at once; but if he repays in full before the due date, he's free. ^ Pravda Russkaya / ed. by Boris Grekov. - Moscow; Leningrad: publisher of the Academy of Sciences of the USSR. - Vol. 3: Facsimile of the texts. - 1963. (Russian: Правда Русская / Под общ. ред. акад. Б.Д. Грекова. - М.; Л.: Изд-во АН СССР. Т. III: Факсимильное воспроизведение текстов. - 1963). ^ "Yaroslav I". The New Encyclopædia Britannica. 12 (15th ed.). 2003. p. 823. ISBN 9780852299616. Under Yaroslav the codification of legal customs and princely enactments was begun, and this work served as the basis for a law code called the Russkaya Pravda (“Russian Justice”). ^ Yaroslav Padokh (1993). "Ruskaia Pravda". Encyclopedia of Ukraine. Retrieved 5 March 2016. ^ А. М. Камчатнов. Хрестоматия по истории русского литературного языка (Памятники X - XIV веков по рукописям X - XVII веков). Москва, 2009 год. ^ А. А. Зимин. Правда русская. Монография. Москва, "Древлехранилище", 1999 год. ^ Yushkov, Serafim. Course of the History of State and Law of the USSR. - Moscow: Yurizdat (Juridical Publisher), 1949. - Vol. 1: Social and Political System and Law of Kievan State. - 542 p. (Russian: Юшков С.В. Курс истории государства и права СССР. – М.: Юриздат, 1949. – Т. I: Общественно-политический строй и право Киевского государства. – 542 с..
^ Zimin, Aleksandr. Pravda Russkaya. - Moscow: Drevlekhranilische ("Archive"), 1999. – 421 p. (Russian: Зимин А.А. Правда Русская. – М.: Древлехранилище, 1999. – 421 с.). ^ W.E.D. Allen. The Ukraine: A History. p. 16. ^ Ekaterina Brancato. Markets versus Hierarchies: A Political Economy of Russia from the 10th Century to 2008. p. 66. English translation of Short Russkaya Pravda by Daniel H. Kaiser: Source: The Laws of Rus' - Tenth to Fifteenth Centuries, tr., ed. Daniel H. Kaiser (Salt Lake City: Charles Schlacks Publisher, 1992), 15-19. English translation of Vast Russkaya Pravda by Daniel H. Kaiser: Source: The Laws of Rus' - Tenth to Fifteenth Centuries, tr., ed. Daniel H. Kaiser (Salt Lake City: Charles Schlacks Publisher, 1992), 20-34. Main edition: Pravda Russkaya / ed. by Boris Grekov. - Moscow; Leningrad: publisher of the Academy of Sciences of the USSR. - Vol. 1: Texts. - 1940. Vol. 2: Commentaries. - 1947. Vol. 3: Facsimile of the texts. - 1963. (Russian: Правда Русская / Под общ. ред. акад. Б.Д. Грекова. - М.; Л.: Изд-во АН СССР. - Т. I: Тексты. - 1940; Т. II: Комментарии. - 1947; Т. III: Факсимильное воспроизведение текстов. - 1963). Memorials of Russian Law / ed. by Serafim Yushkov. Issue 1: Memorials of Law of Kievan State of the 10th-12th centuries / Aleksandr Zimin. - Moscow: Gosyurizdat (State Juridical Publisher), 1952. - 287 p. (Russian: Памятники русского права / Под ред. С.В. Юшкова. – М.: Госюриздат, 1952. – Вып. I: Памятники права Киевского государства X–XII вв. / Сост. А.А. Зимин. – 287 с.). (in Russian) Mikhail Tikhomirov, "A study of Russkaya Pravda"
The Sudebnik of 1497 was a collection of laws introduced by Ivan III in 1497. It played a big part in the centralisation of the Russian state, creation of the nationwide Russian Law and elimination of feudal division. A kholop was a feudally dependent person in Russia between the 10th and early 18th centuries. 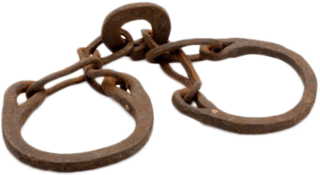 Their legal status was close to that of slaves. Throughout the early Middle Ages, the Rurikid knyazes of the Kievan Rus' used unique symbols to denote property rights over various items. They are depicted on punches, seals, and coins of the Rurikids. In contrast to Western European heraldry, where coats of arms belonged to entire families, or were inherited without changes by firstborn sons, Rurikid symbols were personal, with every knyaz devising an emblem of their own for themselves. Church Statute of Prince Volodimir is a source of church law in Old Rus', defined legal authority of church and legal status of clergy by the state: prince (knyaz) and his administration. Vladimir's Statute was a short legal code, regulated relationship between the church and the state, including demarcation of jurisdiction between church and princely courts, and defined index of persons and organizations within the church jurisdiction. The church also got under its supervision the system of weights and measures, and monthly support: tithe from all princely income. The statute was written at the beginning of the 12th century and remade during many centuries. The statute was written in Old Church Slavonic and Old Russian. It was one of the first church sources of Old Russian Law. Church Statute of Prince Yaroslav and other Old Russian princely statutes served to closely purposes. One of the sources of the statute was Byzantine law, including Nomocanon. Church Statute of Prince Yaroslav is a source of church law in Old Rus', defined legal authority of church by the prince (knyaz), his administration and churchmen. Yaroslav's Statute was a short legal code, regulated relationship between the church and the state, including demarcation of jurisdiction between church and princely courts, index of persons within the church jurisdiction, rules of family law and sanctions against moral violation. The statute was written at the 11th–12th century and remade during 13th–16th centuries, in Old Church Slavonic and Old Russian. It was one of the first church sources of Old Russian Law. Church Statute of Prince Vladimir and other Old Russian princely statutes served to closely purposes. But church jurisdiction was expanded in comparison with Vladimir's Statute. A part of the lawsuits in the Yaroslav's Statute was referred to the church jurisdiction, and a part - to joint jurisdiction of the church and the prince. One of the sources of the statute was Byzantine law, including Nomocanon. Pravosudiye Mitropolichye, lit. Metropolitan's Justice) is a source of Old Russian law. It reflects the influence of the secular norms on Old Russian church law.